Situated in the heart of the Douro region, overlooking the picturesque vineyards and olive groves, with panoramic views from both inside and out, Villa Elizama offers a unique. Situated in the heart of the Douro region, overlooking the picturesque vineyards and olive groves, with panoramic views from both inside and out, Villa Elizama offers a unique, romantic holiday location for the whole family. Converted from an old house, the character and charm of this villa are unique, perfect for an unforgettable holiday with your loved ones. Throughout the villa, the furnishings are traditional, creating a homely, welcoming atmosphere. Each room is large and spacious, with the contemporary conversion adding a modern touch, with right floor-to-ceiling glass doors, bringing the outside in, and creating a seamless barrier between the interior and exterior so that you can meander in and out with ease. On the ground floor, there is a spacious, open-plan living and dining room with a large fireplace. The dining table comfortably sits eight guests, so the whole group can gather around and enjoy evening meals away from the hustle and bustle of day to day life. The living room boasts comfortable sofas where you can put your feet up and read your book. This spacious room is ideal for the whole group to spend quality time together, even when occupied with different activities. The kitchen is fully-equipped and ready for you to whip up some delicious meals, with the option to dine either inside or outside on the sunny terrace. There is a games room with a snooker table; ready prepared for any competitive members of the group! Throughout the villa, there are three good-sized bedrooms, all of which boast en-suite bathrooms. There is also a studio room with a sofa-bed that comfortably sleeps, two guests. All the rooms are carefully furnished, with plenty of storage for all your belongings. Outside on the sunny terrace, guests can immerse themselves in the stunning surrounding landscapes. Whether you are sitting back reading your book, sunbathing on a lounger or sipping a cocktail by the private pool, there is room for everyone to enjoy the sunshine! Villa Elizama is a charming, converted, 4-bedroom holiday house that can comfortably accommodate 8 guests. 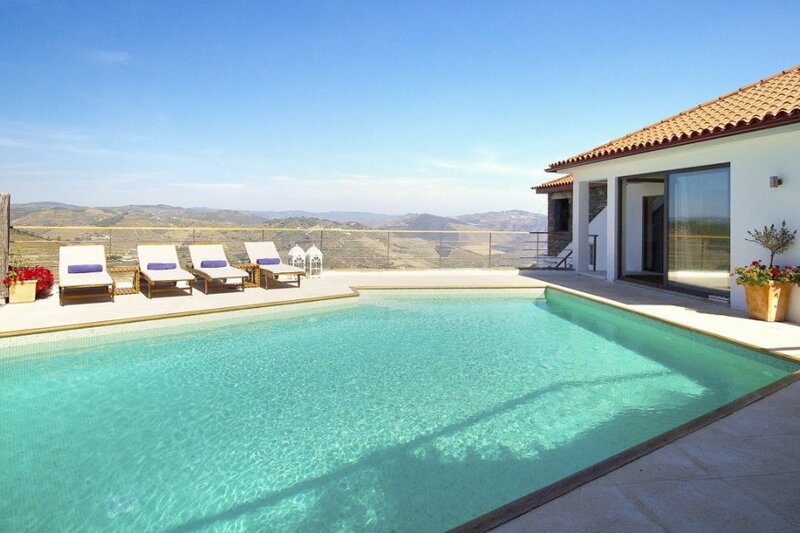 Overlooking the Douro wine region, there are beautiful views from the whole property. Essential amenities such as shops and cafes are within short driving distance, but you'll need to head to a nearby town for supermarkets, restaurants and bars. The villa is an excellent base for touring the surrounding vineyards, many of which offer private tours and tastings. The picturesque town of Pinhao is just a ten-minute drive from the villa through winding roads cut into the terraced Douro Valley hillsides. As well as being within a well-known wine-producing region, the town also has a rich port heritage and produces some of the best in the world. You can go on guided tours of wineries and sample some of the local tipples. Pinhao is situated along the Douro River, meaning you can explore the area with a boat tour down the river. During a trip, you'll appreciate the steep vineyard terraces from a different perspective, and if you're lucky, you'll spot a range of wildlife along the way. Another must-see attraction is Pinhao's railway station, built in 1937 and famous for its beautiful blue and white azulejo tiles that depict traditional Portuguese country life. There's also a bar and shop giving you the chance to try some wine and port. Around 12 km from the villa is Provesende, a historic town that's full of interesting sites to explore. Walk down the winding streets, and you'll come across a 16th-century pillory and 18th-century Baroque church and fountain. There are also many old manor houses that sit alongside more modest village cottages to show how rich the area was in past centuries.